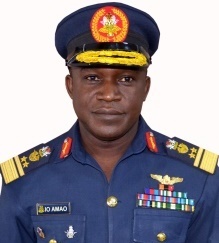 Air Officer Commanding Tactical Air Command, AVM Oladayo Amao, has given reasons for the temporary closure of the Nigerian Air Force (NAF) airfield housing the Makurdi Airport, in Makurdi, the Benue State capital. AVM Amao, in a chat with newsmen, on Saturday, allayed fears that the airfield might have been closed for unjustifiable reasons saying the closure was to allow repairs and maintenance of the runway which had started giving way. “The runway, as you may have been aware, has been closed for some time now for repairs. “The sealants that were used to hold the runway together have given way and grasses are growing on it already which is very dangerous. “The work would have been completed before now but the problem we have is getting the sealants itself. He said it was because of the closure of the airfield that the fourth quarter route march of the Command could take place on the runway. “Today, unlike other similar exercises, we had the privilege to march through the runway. “Our airfield here has been closed for a while due to the ongoing repairs at the runway and this afforded us this opportunity,” AVM Amao stated.